"KANON!!!!!!!!!!!!!!! ", shouts Shun as he sees the Gemini Saint fall with his heart punctured! "Like I said...", says Hecate smiling, "It's your turn!" Shun has never been this angry before he shouts, "I WILL AVENGE KANON!! Shun can't finish because he can feel a strong Cosmo from Kanon's body! "What is this? ", shouts Hecate, "I can feel a Cosmo from Kanon but it is slightly different! What's happening!?" Kanon slowly stands back up and he says, "Hecate... you know alot about my brother and me, but do you know what is the real meaning of my name...?" "Yes. But that is not the meaning of my name... 'Kanon' has another meaning which is, 'Standard'." "Standard...? ", wonders Hecate, but finally it occurs to him, "You... You mean the 'Kanon' in music!!" "Yes! ", smiles the Gemini Saint, "Kanon, a musical composition where one voice introduces a melody and, after a given number of beats, a second voice repeats or answers that melody, note for note. If the melody leads back into its own beginning, that piece can be repeated, forever." "Forever..." cries Hecate in wonder. Kanon burns his Cosmo to the extreme! BUT THE ORACLE CAN FEEL 2 COSMOS!! "IMPOSSIBLE!!" "Hecate! You may have destroyed the Gemini Cloth but the Spirit of My Brother is still here!!" Right then, the image of the original Gemini Saint appears behind Kanon! "HECATE!! BATHE IN THE EXPLOSIONS OF GALAXIES!!! [HEKATI YO! GENGAKEI NO BAKUHATSU WO ABIRO!!! Kanon first launches a GALAXIAN EXPLOSION. One heartbeat later, the image of Saga, releases another GALAXIAN EXPLOSION! One explosion explodes to the left of Hecate, another explodes to his right, and then another and then another and then another, all around the Lightner! The explosion seems to go on with no end but finally Kanon and Saga commands the explosion to stop! Hecate is no more, not one trace of him can be found! Seeing this, Kanon smiles but not because he defeated the Oracle. He says softly, "Brother..."
Kanon falls. His Cosmo, Saga's Cosmo, his life-force, Saga's image, slowly disappears. Shun rushes over. He dares not touch him but, he looks at him intently, and says softly, "Kanon..."
wondering around the area, however the road that leads to next Purge is clear. The Lightner of this Purge appears, holding a sword. "I won't let any of you pass!" Just as he raises his sword to attack the Bronze Saints there is! Up comes the Circle Chain flying toward Haman wrapping around him many times, holding him tight! Not even a bear can escape from this bind! Right then, Shun and the others take this chance to pass by the Oracle and Shun shouts, "As you said, Seiya, this place is left to you!" With that, the hold of GREAT CAPTURE is released and they disappear toward the next Purge. "Haman! I am your opponent! ", shouts Seiya. "Ha! ", remarks Haman, "You want to die that much... Okay then! SWORD OF FLAME!!!" "What!? ", shouts Seiya. This time it is Seiya who is surprised. It turns out the sword held by Haman is not just any sword but is wraped up in fire. "Hmmm...." groans the Procne Lightner, enjoying the crackings sounds of the burning flames. It is like music to his ears. Haman lunges for Seiya screaming, "SHAHHHHH!!!!!!!" He swings the sword across Pegasus's chest! Seiya jumps back to dodge it! "SHAH! SHAH!! SHAH!!! ", screams Haman, aiming the tip of the sword at Seiya's head, legs, arms! Seiya dodges those attacks by a hair's length! Finally, Haman swings down to cut Seiya into two pieces but Seiya blocks it with his left arm! "GYAHHHHHHHHH!!!!!! ", screams Seiya with the flames burning him! Seiya kicks with his right foot to force Haman off! Haman jumps back happy. Holding his burnt arm, Seiya grinds his teeth because of the pain. It would have definitely been a five-degree burn if not for the protection of the Cloth! "So sad...", cries the Lightner. "It's a shame you don't have a weapon to use against me..."
"We Saints are not allowed to use weapons!" "Please! What about the Chains of Andromeda and all those other weapons for other Saints. How are they different than what I have holding in my hand?" "The difference is huge! ", shouts Seiya, "Only those of the Libra Cloth can be considered weapons. The reason is that the Andromeda Chains and the like can be controlled..."
"For example, around the world, there are countless weapons available for combatants but do you think attacking someone with a baton is the same thing as shooting someone with a gun!?" "So what're you saying is the Libra Weapons are like guns where there is certain death...?" other Cloths can be controlled. Athena's goal has always been for peace, not death nor killing!" "HA! ", laughs Haman, "That's too naive of Athena! Even if Zeus didn't demand us to kill you Saints, I would do it anyway! DIE!!!! BURNING HEAVEN!!!!!!!!!!!!!!!!!!!!!!!!" From Haman's sword, a giant spray of flame rushes to Seiya, ready to burn him to nothing but suddenly, Seiya disappears! Haman looks around and he can't find Seiya but right then! Haman looks up and Seiya is flying because his Pegasus Cloth has spread wings! "TAKE THIS!! PEGASUS SHOOTING STAR PUNCH!!!!!!!!!!!!" [KURAE!! PEGASASU RYUUSEI KEN------------!!] Seiya dives down to launch his Finish Blow at the Lightner! Haman is hit a millions time over by Seiya's punches but the Oracle is calm, hiding behind his Flaming Sword! He waits until Seiya is done and approaches close! He swings his sword side ways to knock Seiya to the ground! "GYAHHH!!! ", screams the Pegasus Saint while his right shoulder protion of his Cloth explodes! 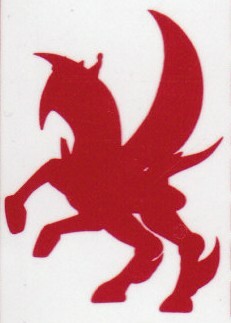 The Pegasus Saint crashes to the ground, enduring the massive pain. Haman slowly walks to stand over Seiya, smiling. He raises his hands, the sword, burning to kill its prey! Seiya knows this is it! The Lightner swings down! But right then, Haman's Halo cracks and expodes! "GYAHHHHHHHHHHHHHH!!!!!!!!!!!!!!!!" screams, Haman! He drops to ground and wonders, "Why is my Halo not returning!?" "Shiryu already told all of us the characteristics of your armor!" "Then!? ", says the Lightner slowly standing up! STARS PUNCH destroying your Halo." "Ha! I still have my sword!! DIE!!!!!!!!!!!!!!!!!!" Haman runs over to cut Seiya to death!! But right then, Seiya's wings are alive again!! From his right leg Seiya launches millions of kicks straight at the Lightner! Like a geyser shooting up, the kicks drive Haman up, meters in the air! His SWORD OF FLAME are hit a millions times over, sent flying and disappears! Haman crashes to the ground, near-death! 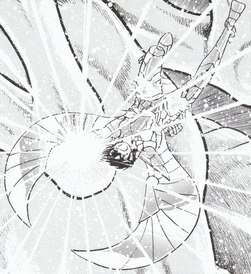 Seiya lands back safely and retracts his wings. He was about to leave when he hears, "Peg... Pegasus... I know for sure you are no match for me but why did you win!?" 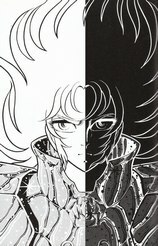 "Haman...", says Seiya with his back facing him, "It is because... I have a goal..."
"For a man, once he has decided to do something, he goes and does it with no hesitation. My mission is to find Metis. I don't even need to know what Metis is. All I need to know is I have to reach it..."
After hearing these words, the Pronce Lightner finally breathes his last breath. Seiya was about to leave again when he notices the dead souls here are singing. '...Pa-ee-an Ee-eh Pa-ee-an...', they sing. This singing is very familiar to Seiya. Episode 6: Amethyst vs. Diamond!! In the Fourth Purge, the dead souls are running without pausing but so does Shiryu and Shun. Shiryu just used his punch to force the Lightner to move out of the way as they head for the next Purge. "So, you are my opponent...? ", says the Cygnus Saint. "I am Sloth, Amana, Antoin..."
"No... I don't want to know your name..."
"Really...? ", says Hyoga, "Then know the name of my skill! DIAMOND DUST!!!!!!!!!!!!!!!!" an ice statue of the Lightner is formed! But right then, Antoin says to himself, "As expected..."
In an instant, all the ice formed around the body of Antoin spurts away! "WHAT!? ", shouts Hyoga but not because of the expulsion of the disintergrated ice but he sees his right arm is frozen in ice!! The Cygnus Saint finally realizes that as he was launching DIAMOND DUST, at the same time, Antoin launched an ice attack toward his arm, disabling it. "You are a Saint who uses skills that comes close to Absolute Zero but sorry, those skills won't work on me..."
"What!? 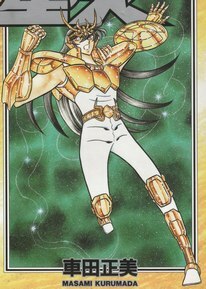 ", shouts Hyoga, holding his right arm who has lost all feeling with his left hand. "Well, do you want to wear a Halo now so you can heal your left arm?" "Ha! ", smiles Hyoga, "It should be me that asks that question..."
"What? ", says Antoin in wonder. He looks down and he sees. "Know this name, too, Antoin! 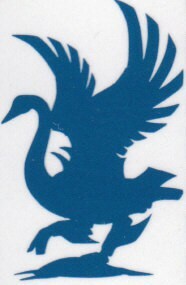 THE SEAL OF THE CYGNUS!!" "Fine then!" shouts the Lightner, "I'll show you the real power of this Oracle!! Out comes the Lightner's Finish Blow, purple crystals flys out to bombard Hyoga! Hyoga tries to use his Cold Air to protect himself but it doesn't work! "It's useless. My skill is not just any skill. Not only have I have launched an Amethyst Blow at you but it is at a level much closer to Absolute Zero than you'll ever get!!" Before long, Hyoga is contained in a purple crystal that is shaped as a pyramid. The Cygnus Saint is like a insect contained in transparent resin for display purposes. "Guhh....", groans Hyoga inside the Amethyst Prison. Antoin walks over to stand infront of the purple, transparent, container. "Saint! This is why I didn't want to know your name. I like my art to be nameless! Ha ha ha! Don't feel so bad. You are much better than those sorry souls who have to run forever and ever here." "Kuh! ", groans Hyoga in the prism, "An... Answer me this! Antoin! If those souls do become cleansed, what does it mean that they will attain Ultimate Happiness...?" "Ha ha ha... When they leave here, they will rise towards the Ultimate Paradise!" "YES!! SAID TO BE BEYOND THE RIVER ENUOE, THE UPPER STREAM OF THE FOURS RIVERS OF PURGATORY! THE HOME OF THE GODS!! OLYMPUS!!!" "...", Hyoga has nothing to say. "Don't worry! Your body and soul will stay here, maybe once in a while, one of the Gods would come and visit you! HA HA HA HA!!!!!!" "Antoin! I won't stay here long. "My Brothers and I will reach Olympus and challenge the Gods!" "Ha! You must be going mad in that..."
But the Lightner can't finish! Suddenly, he can sense his opponents's Cosmo burning! Before long, the purple pyramid starts to crack and pieces fly all over the place! 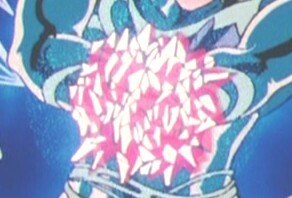 Hyoga concentrates all the Cold Air he has created inside his left palm and a many pointed, crystal sphere is formed! "ANTOIN! I'LL SHOW YOU THE REAL TECHNIQUE OF ICE!! [ANTON YO! SHIN NO KOORI NO TOUGI WO MISETE YAROU!! He launches the sphere flying toward the Lightner, just the mere force of the approaching blow destroys Antoin's Halo totally and the Crystal Sphere punches through his body! "GYAHHHHHHHHHHHHHH!!!! ", screams the Lightner and falls on his back, unbelieving what just happen. Hyoga is about to leave for the next Purge when Antoin asks him, "Wha... What was that attack just then...?" "If my DIAMOND DUST is 'SPREAD', then that skill is 'GATHER'!!! THE BLASTING ATTACK OF THE CYGNUS!!" Shiryu and Shun are running fast. They just arrived in the Fifth Purge. They both see the Lightner of this Purge standing in the way. "Leave this place to me! ", shouts Shun! "Okay! ", shouts Shiryu who was about to launch a punch to move the Oracle out of the way but suddenly the Oracle disappears! The Warrior of Zeus has infact jumped up and launches a diving kick at Shiryu! The Dragon Saint blocks the attack with his shield, but the massive kick of the Lightner destroys the shield totally!!! "It's okay! My shield is destroyed but my arm is not broken!" "Really...", says the Lightner with a grin. "WHAT!? ", shouts Shiryu, as he can see his left arm is slowly turning to gold! Within moments, Shiryu has turned into a golden statue! "What is this!? ", shouts Shun, deeply distressed. "GOLDEN TOUCH...", says the Lightner, "Everything I touch will turn instantly into gold..."
What is the real truth about Shun's birth? And, the name of Shun and Ikki’s Mother is!!? ?